This last article about the Timeline is sort of a bonus for those who want to know ‘everything’ about the timeline panel. The color codes can be a quick visual help to recognize object timelines, and I personally use the shortcut keys quite a lot to avoid the many mouse movements to the different tabs in the Properties panel. The color coding is the same for master slide timelines and slide timelines. The hexadecimal code is just an indication because a lot of the timelines have a gradient fill. You see the colors in the image following the bulleted list. I love shortcut keys, once published my favorites for moving/resizing objects (which are still functional). The timeline panel has also several shortcut keys, which can save time because you don’t have to switch to the Properties panel all the time. Some of the shortcut keys also work for Effect timelines, but not all. Spacebar or F3: alternative shortcuts for the play button on the timeline panel or the option Play Slide (confusingly stored under the big button Preview). This method (no Preview) can be used for editing timing, for synchronizing. Use this ‘Play slide’ (or scru to position the Playhead, and you can then easily synchronize start times of objects with this Playhead position. Inserting an object when the playhead is at a certain frame will result in having the object timeline starting with that frame. LEFT/RIGHT arrow: moves start of an object timeline 0,1sec in the indicated direction. Applied effect timelines move with the object timeline. Shortcut keys also work for audio timeline. This was the last article in the (long?) sequence about Captivate’s Timelines. I learned from the contacts with Captivate users, as forum moderator, trainer and consultant, that the Timeline is the most important stumbling block for starting Captivate users. For that reason I spent quite a lot of hours trying to assemble this ‘soap’ about it. Based about that same experience, and the statistics of my blog posts, I see two other similar issues causing problems to Captivate newbies. In the next article I will try to elaborate on those ‘big’ 3 and offer links to tutorials/articles that explain them in depth. I find ctrl+E very useful. Still, is there a way to extend the duration of all the objects in the slide to “rest of the slide” using a single command or shortcut key? Thanks! Sure: select all the timelines in the Timeline panel and use CTRL-E. You can use the SHIFT or the CTRL key in the usual way for selecting. Beware: the pausing point of interactive objects will not move but remain at 1,5 secs from the start of its timeline if you didn’t change it. Is there a way to move 0.1 sec increments either way on the timeline using the keyboard, without affecting the length of the timeline, or any objects on the timeline? That is to say, stepping back and forth along the timeline in 0.1 sec increments. Depends on the setup of the object timeline: fixed duration or timed for the rest of the project. Did you read the other articles about the Timeline? Yes I’ve scoured the community for info on the Timeline, and read every article I could find, and I haven’t found a way to use arrow keys to step back & forth in 0.1 sec increments along the timeline, without affecting objects on the Timeline, or the length of the slide. Most often I set the Timing for objects to Rest of Slide, or Specific Time. I rarely set object Timing for Rest of Project. For an object timed for the rest of the project, changing the duration of an object timeline has no sense. For Fixed duration: the slide duration will increase when you move the object timeline with a shortcut key, or increase its length with a shortcut which causes the end of the object timeline to the end of the slide timeline. As I explained in my first article about the Timeline the slide duration is calculated to accommodate all the object timeliknes: the end of the last object timeline will be the end of the slide timeine unless you increase the slide duration separately. Have also a look at that first article to see the difference between Rest of Project, or attached to the end of the timeline. When set For rest of slide, moving the start of the object timeline will not have any impact on the slide timeline, whether you increase or decrease the object timeline with an arrow or a combination with arrows. That is IMO the setting to be preferred in most cases. You can even set it as default in Preferences. BTW would like to know if you did find articles written by other authors? I never did see one although lack of understanding that timeline is the cause number one of questions in the forums. End key to fast forward to the end of it. None of these keys will impact the slide length, or the length of any object on the timeline. They’re only meant to be convenient shortcuts to navigate to different points in the timeline. These keys work this way, regardless of whether objects are set to Specific Length, to Rest of Slide, or Rest of Project. I was hoping that there might also be a means to step forward & back through the timeline, in 0.1 sec increments which, like the keys I’ve listed above, don’t impact the slide length, or the length of any object on the timeline, but only as a convenient way to navigate to specific points in the timeline without having to use the mouse. Unfortunately, I don’t believe there’s a way to do this. Pressing the right and left arrow keys increase/decrease by 0.1 sec, the length of either an object in the timeline, the timeline itself, or both. Pressing Ctrl + right & left arrow keys does the same, but by 1 second-increments. But there’s no way to use the arrow keys to simply step forward & back through the timeline. Holding down the Shift key or Alt/Opt key makes no difference. Please correct me if my understanding is incorrect, but it seems that this functionality would be best to bring to Request a Feature. Btw, yes I found various articles about the timeline by other authors. Most of them covered basic information, and very few mentioned how to use shortcut keys with the timeline. Please tell me which authors? When I have explored the web before staring my long list of articles about the Timeline I didn’t find any in-depth article, and even a lot of wrong information which may have been correct many years ago but no longer. I never felt the need to navigate frame by frame in a cptx project, as I have in a Video Demo (cpvc). 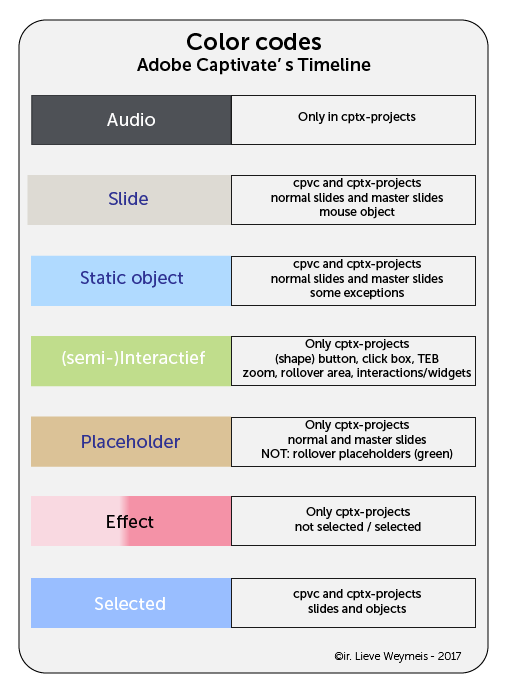 Since a cptx is slide-based, I tend to keep slides pretty short, because you can distribute content over multiple slides which makes it not only lot easier to manage, but audio clips will be shorter and load quickly (important certainly for responsive projects). I am perfectly happy with the Playbar to play and pause where I want, where I can then insert an object or move its start to the playhead position. However I would like to have a similar shortcut to align the end of an object timeline to the playhead. I may be wrong but my intuition tells me you are seeing a cptx-slide too much as a video slide. It is a hybrid, in between static and video slides. Thank you for posting! I am new to Adobe Captivate.